Since the formation of the LAPD shortly after the close of the civil war, there has been a close link between the department and the military. Our uniforms have followed in the style of the armed forces. And, our men and women have served before, during and after their tenures with the department. In the aftermath of 9-11, more than 200 were activated from the ranks of LAPD. Now, 27 LAPD officers are on active duty in places like Iraq and Afghanistan. These far away places are by no means the only foreign lands that officers were called to serve. More than sixty years ago, scores served in the European and Pacific theaters of World War II. 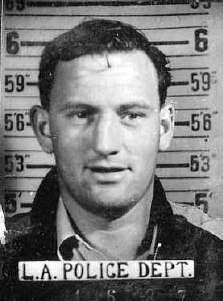 It was in the conflicts of DDay and the Battle of the Bulge that seasoned a UCLA student-athlete for his future in the LAPD. In recent years, a book and ensuing television mini-series brought the heroic acts of an army and LAPD veteran to the forefront. Most recognize his name as one of the main characters in Band of Brothers, but his history is not confined to military annals. His is a story of Los Angeles, and of the LAPD. Lynn “Buck” Compton, a native Angeleno, starred in football and baseball at UCLA. The day following his 21st birthday he played in a Rose Bowl game. He went on to earn All-American honors on the baseball diamond while playing alongside Jackie Robinson. Before the next Rose Bowl, he was called to service with a group of men who would become known as the Band of Brothers, Easy Company, 506th Parachute Infantry Regiment, 101st Airborne Division. The book and the miniseries detail some of the heaviest fighting in which our country engaged in Europe during the Second World War. A story of a group of dedicated paratroopers played out against a backdrop of anti-aircraft and artillery fire. Buck was wounded in combat and awarded the Purple Heart. For heroism, Buck earned a Silver Star and a Presidential Unit Citation. These were experiences that drive individuals to various pursuits. It drove Buck Compton to a life of public service. Compton’s service started here, with the LAPD. Buck Compton joined the LAPD in 1947 working as a patrol officer and playing baseball for the Department’s team. The team was of a semi-pro variety, populated by former major and minor league players. Their schedule included a stop in Chicago to play a benefit game billed as the United States police championships. Thousands turned out at Wrigley Field to watch and support the relief fund of the Chicago Police Department. LAPD swept the three-game series. In his tenure with the LAPD, Buck left patrol for an assignment at the Central Burglary Detail, then finally he left us entirely. Buck was attending Loyola Law School, and in 1951 Buck moved on to the Office of the District Attorney. Buck rose through the ranks, and finally earned a post as the Chief Deputy District Attorney. After the tragic 1968 slaying of Robert F. Kennedy, Buck Compton was chosen to prosecute Sirhan Sirhan. Buck Compton may not have landed the biggest cases in LAPD history while he was a cop, but he landed one at the DA’s office. The investigation of the RFK assassination was a massive undertaking. More than 4,800 interviews were conducted, some 2,900 photos exist and as the California State Archives describes, “…a bewildering number and variety of audio and videotapes” were made. From all of this, Buck Compton, aided by investigators from his former employer, secured a conviction. Forty years later the assassin remains imprisoned. The RFK case remains the largest investigation of a single homicide in LAPD history. Not long after the conviction of Sirhan Sirhan, Buck Compton was summoned for more public service by another great Californian, Ronald Reagan. Buck was appointed to the Court of Appeals where he loyally served until 1990. Buck rendered more than 2,000 opinions while seated on the bench. Serving the state seemed to complete a historic career. It was a career path that covered national, state, city and county service. He logged victories on ball fields and battle fields and in station houses and court houses. His story will soon be detailed in a book. Buck’s biography is due to for release in the coming months. The cover photo depicts Lt. Compton during his army days. Our photo shows Officer Compton during his LAPD service, the paratrooper turned policeman. If the museum had a throttle, it would be fully engaged. Pedal to the metal. That’s how this year’s operations have started, and this is why. We are hosting our Chief’s Circle luncheon at the California Club to honor those who support us at a high level of giving. Chief Bratton has graciously volunteered to address the group and retired Chief Daryl Gates has volunteered to host the event with one of our thoughtful Directors, Russ Colvin. Around the same time we will be rolling out our first challenge coin. The design will be unveiled shortly, and the coins will be available for purchase through the Historical Society. Shortly after this, the restoration of the 1955 paddy wagon will conclude, and we will have the vehicle on-site for display. While all of this is going on, we have arranged our first special event for the year, and it is an evening that we are proud to announce. 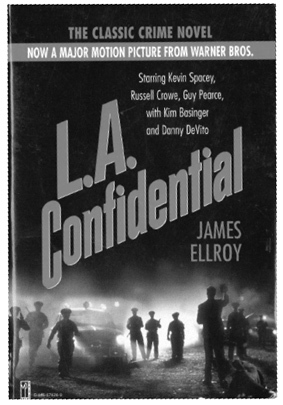 LA Confidential: Behind the Scenes with James Ellroy and retired Chief Daryl Gates. We will host a screening of the movie LA Confidential at 7 p.m. on April 2, 2008, at Paramount Studios. James Ellroy, the book’s author, will provide his comments about the fifties-era fictional LAPD, and Chief Gates will offer his insight about the real Parker-era Department. Included in the fifty-dollar ticket price are refreshments and a paperback copy of LA Confidential, which the author will be available to sign. Tickets are only available through the Historical Society, so stop by or phone us at (323) 344-9445. Not long after the special screening, we will be participating in the annual Museums of the Arroyo Day festivities. On May 18, we will join five other local museums and host visitors free of charge. Shuttle buses will use our parking lot for two different museum routes. One route will take visitors to the Pasadena Museum of History and the Gamble House. The other will transport folks to the Southwest Museum, the Lummis Home and Heritage Square. Both shuttle lines cover the LAPM museum. Last year we had scores of visitors. This is truly a great way to visit some interesting local museums. We will be open from 11 to 5, and this will be the only Sunday during the year that we are open. We hope you can stop in. As we plan these events, we are also working closely with the DEA. They are planning to open a significant exhibit at the California Museum of Science and Industry later this year. 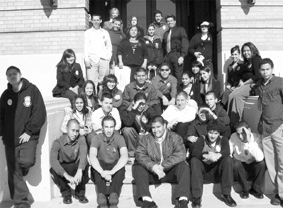 Scheduled for August, 2008, their exhibit will showcase both the national and local history of narcotics enforcement. We have been working to support their efforts for some time now, and are looking forward to seeing our research and material on display. When we are not traveling full speed down these roads, we remain busy with tour groups, research, speaking engagements and the occasional visits from VIP’s. Recently we have had the good fortune to visit with Mrs. Jack Webb and her grandson Miguel. We also visited with relatives of two legendary members of 1920s LAPD, Ervis Lester and Oscar Bayer. Deputy Chief Lester’s great grandson stopped in to share some of the experiences he enjoyed with his great grandfather. Oscar Bayer, Jr. and his brother Roy and their families came by and shared a scrapbook with us. Both of these officers had storied careers, and we were pleased to learn more about their service. The future paid a visit to the past recently. This group of Police Academy Magnet students from Reseda High took in the rich history of the LAPD during their January museum tour.